PETALING JAYA: Dijaya Corp Bhd wants to build up its market presence in Johor and Penang, and expects to see a bigger contribution from the two growth markets. Although the central region of Selangor is still the biggest contributor accounting for more than 70% of the company's sales and bottomline, Dijaya managing director Datuk Tong Kien Onn is looking at bigger contribution from the northern and southern regions. “We want to build a stronger presence in these two markets to take advantage of the strong growth in Penang and Johor,” Tong told StarBiz. Over the next two to three years when the projects started to move, he said contribution from Selangor was expected to drop to about 40%. Dijaya plans to launch RM1.1bil worth of projects this year compared with about RM700mil last year. 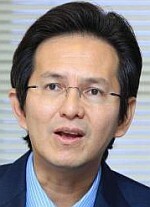 For 2012, it is targeting sales of between RM650mil and RM700mil. 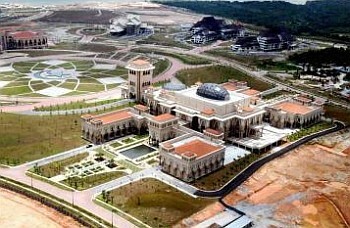 Last year, it sold about RM420mil worth of properties. The first project, Tropicana Danga Bay on 37 acres is a 60:40 joint venture between Dijaya and its partner. The project under the joint venture company, Global Corporation Sdn Bhd is located only about five minutes to the Johor-Singapore Causeway. The land was purchased at a cost of RM318mil about 1 years ago. Tropicana Danga Bay with expected gross development value (GDV) of RM3.8bil will comprise 60% commercial and 40% residential components. It will take eight to 10 years to complete. The first phase comprising a block of 420 service residences was launched last December at average prices of RM620 per sq ft. Tong said about 90% of the non-bumi lots have been sold to-date. Dijaya also has a 50:50 joint venture with Iskandar Waterfront Sdn Bhd to undertake the 225 acre Tropicana Danga Cove. 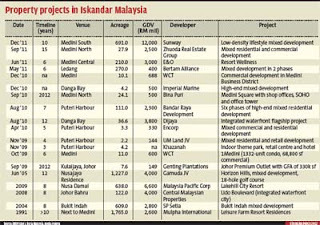 The land was bought for RM220mil in the last quarter of 2011. The RM2.8bil development is expected to take 10 to 12 years. Construction of the project may kick off in March with the first phase comprising 3-storey shop offices. In Penang, Dijaya has set up a 55:45 joint venture with Ivory Properties Group Bhd to buy and develop a 41.02ha site in Bayan Mutiara. The joint venture company, Tropicana Ivory Sdn Bhd paid RM1.07bil for the land and the repayment period will be over five years. Tropicana Ivory will undertake a mixed residential and commercial property project with GDV of RM9.8bil over the next eight to 12 years. Last Thursday, Dijaya received the nod from its shareholders to enter into the joint venture with Ivory Properties. Tong said the master plan for the Penang project would be finalised in the next two to three months and the mixed integrated development is set to showcase some iconic structures. 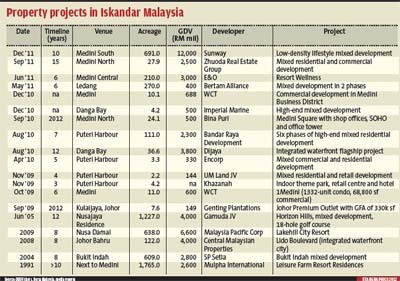 Meanwhile, in Selangor, projects in the pipeline this year will comprise two new projects in Tropicana Indah Resort Homes namely Golf Villas and Tropicana Garden. In Subang, Dijaya plans to build three-storey link, semi-detached and bungalow houses, condominiums as well as commercial development on its 35.4ha landbank. Also in the pipeline will be bungalows, link houses and semi-detached units at Tropicana Cheras and Tropicana Balakong. 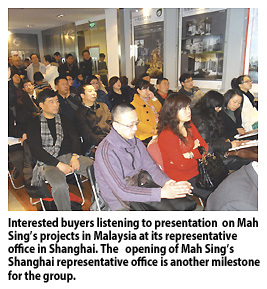 KUALA LUMPUR: The growing interests from Chinese investors in Malaysian properties has prompted Mah Sing Group Bhd to open a representative office in Shanghai to feature its residential and commercial properties. The office will serve as a business liaison between Mah Sing, local regulators and local companies in China to explore the property development industry in China. It will conduct market and product research, marketing, brand promotion and coordination of the group's activities in China. "In terms of accessibility, climate, culture, livability, and political stability, Malaysia is an attractive avenue for Chinese property investors," said group managing director and group CEO Tan Sri Sri Leong Hoy Kum in a statement. Leong said the opening of Mah Sing's Shanghai representative office is another milestone for the group to firmly establish Mah Sing as Malaysia's premier lifestyle property developer of choice for Chinese investors. Some of the projects with potential sales among Chinese investors are resort-style living Icon Residence Mont' Kiara, residential suit and boutique shops MCity Jalan Ampang and mixed commercial development Icon City Petaling Jaya. Malaysia-listed premier lifestyle property developer Eastern & Oriental Bhd (E&O) has announced the official launch of Andaman at Quayside, luxurious Andaman Sea-facing condominiums touted to be the finest on Penang Island. Andaman at Quayside is sited on 8.5 ha. of the final, most-prime plot on E&O’s acclaimed world-class masterplanned development, Seri Tanjung Pinang, with 75 per cent of all suites providing unobstructed views of the sea and the famous Gurney Drive. Featuring a 1.8 ha. signature waterpark and clubhouse surrounded by an additional 2.8 ha. of tropical gardens along with a world-class retail enclave, Andaman at Quayside offers lifestyle and entertainment experiences by-the-sea. Eric Chan, Deputy Managing Director of E&O, said, "We conceptualised Andaman at Quayside to celebrate the best facets of island living in Penang. "The Andaman at Quayside sits within Penang Island’s largest seafront development and most sought-after residential address," he said in a statement here today. MALAY Chamber of Commerce Malaysia (DPMM) will again embark on a role as property developer, offering medium- and low-cost terrace houses and apartments at cost price. 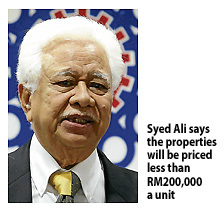 Its president Syed Ali Alattas said the properties will be priced less than RM200,000 a unit. "We were involved as developer in 1975 when our subsidiary Syarikat (Perumahan) Sdn Bhd built 1,340 low medium cost houses in Johor Baru. We sold those houses at cost price, which was not more than RM34,000 a unit then," he told reporters at the DPMM headquarters, yesterday. Syed Ali said that the chamber intends to collaborate with the various state governments for the housing projects and believes this time around it will also be able to sell the units at almost cost price. "We will be writing letters to all the Mentris Besar soon to ask them to allocate us land for this purpose," he said. He said the chamber plans to build 100,000 houses throughout Malaysia including Sabah and Sarawak of which 30 per cent can be acquired by non-Bumiputeras. He said a website will soon be up, providing more information on the type of properties the chambers would be selling. DPMM will build the properties under a new subsidiary called Dewan Syarikah Bhd and will start with a project in Johor. "We are looking at building 220 apartment units in Bandar Uda Utama and believe we can complete the project within eight months," he said. Syed Ali added that it will carry out a design contest for both the terrace houses and apartments which offers a cash prize of RM15,000 for the winner of the low cost apartment category and RM10,000 for the double-storey terrace house category. He said the chamber will not be seeking the participation of non-members in the project as its members include 16,000 contractors, 2,000 engineers and 10,000 consultants. "We've had enough of listening to grouses about sky rocketing house prices ... that is why we are embarking on this project," he added. PECOH Industrial Development Sdn Bhd (PIDSB) today entered into a Joint Development Agreement (JDA) with the Perak State Development Corporation (PKNP) to reclaim 1,360 hectares of land in Bagan Datoh. In announcing this, KYM Holdings Bhd said the project is part of the Perak Eco Industrial Hub (PECOH). Bagan Dato has been identified as an area to initiate projects in PECOH due to its strategic location, and the Perak state government is setting up a heavy industrial zone in its efforts to promote industrial development in the state. PECOH is a subsidiary of PEIH Holdings Sdn Bhd, which in turn is an associated company of KYM.